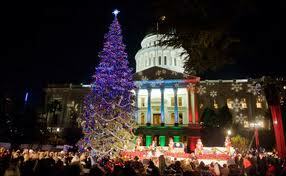 A passing CHP officer saw people acting suspiciously around the tree, located on the east side of Capitol Park, and approached them at about 2 a.m. Two of the people were taken into custody after it was determined that they had tried to remove, and had broken, several ornaments, some made by special education students. Officers booked Marquies Alexis, 30, and Bruce Anderson IV, 32, into Sacramento County Jail on suspicion of petty theft and vandalism. Anderson also faces a charge of resisting arrest because he ignored the officer’s commands, said authorities.Two other people were with Alexis and Anderson but were not arrested because they reportedly were not taking part in the crime. Well, it’s a day before Christmas Eve. With luck, CCC’s Reporter Tribe has convinced Santa Claus to be their “designated driver,” and everyone is making merry, happy to have made it through another year. As for me, I’m fat and happy in my little shack and wondering where I can stick this post, so it doesn’t take up too much room. Out of all the articles on CCC’s current Home page, I figured this article would rouse the least response from my fellow bloggers. I chose this article because Rizzo chose– earlier than most local reporters–to write about a vital yet under-reported topic that is technical in nature, and zealously hidden from public scrutiny by the corporations that are involved with its production: oil. These two characteristics of the industry pose formidable obstacles to local reporters. But I predict the development of oil in San Luis Obispo County will have the most important impact on the county’s residents in the coming year. How does the development of oil affect you? It affects our use of water; the quality of our water; the health of our environment; our national economy, as well as our own; and our international relationships. Our county policies and regulations concerning the development and production of oil are going to set the precedent for California’s energy future and the country’s environmental legacy. 	breaking news on Director Pamela Dean’s successful lawsuit showing that both the District’s long-time attorney Alex Simas, ex-General Manager Raffaelle Montemurro, and Director Jim Hill convinced the remaining Board members to use an illegal board procedure to appoint Angello to the Board with just two out of five votes. 	three grand jury investigations involving SSLOCSD Administrator John Wallace; his contracts with the District as the District Engineer; and managerial/accounting practices of the OCSD. Within weeks of implementing the California Case Management System’s new computer system designed to link 120 state agencies, (referred to as “justice partners” by the Judicial Council,) with courts in California’s 58 counties, Velie broke the news once again about San Luis County judges voting themselves additional benefits on top of the ones they were already getting. The additional financial benefits were approved without going to the state legislature, but instead, by judges voting themselves the benefits, after convincing the Board of Supervisors they had the authority to do so. Only three counties were selected to test out the new system ahead of the others. They are the “early adopter courts” of San Luis Obispo, Ventura and San Diego. The Golden Balls Award for Best Blogger/Activist goes to Kim Martin. •	A cane non magno saepe tenetur aper. “I am not about to feel sorry for a young bimbo that attempts to destroy a young man’s life because she is unwilling to take responsibility for her own actions. I have to agree with you Ghost. I don’t trust the word of someone who is capable of drinking themselves into an unconscious state. That isn’t normal. The average person who drank that much would have vomited the alcohol and while they would still be very sick they would not be unconscious to the point that they didn’t know someone was assaulting them or who is was (if they knew him). I am inclined to believe that these young woman have crossed the line with their alcohol abuse (need intervention) and really don’t know what they did, what they agreed to or with whom they might have agreed. It’s a sad case and I certainly don’t agree that they should have been taken advantage of. Who knows (they don’t) maybe they were raped, it will now be up to a court of law and the testimony of any witnesses since they were too messed up to witness their own “alleged” sexual assault. Not sure what your point is or the case that you’re bringing but whatever, it’s yours. Happy Holiday and God Bless. How would anyone behave ‘suspiciously’ around a tree ? Ornaments made by special education students stolen ? How could you tell ? LOL, You aren’t suggesting what I think you’re suggesting are you? I’ve seen handmade ornaments in the past that often have a signature not unlike a piece of art work. Shouldn’t all of them been held equally responsible in this case? If it had been a bank robbery or a home break in, etc., would they have been let go without charges because they didn’t “take part in the crime”??? Stealing is wrong and the California State Government really hates the competition. At least you got the first part correct; the second part of your statement you got “right”, as in a right wing talking point.